How do you use logic to solve a puzzle that uses letters? 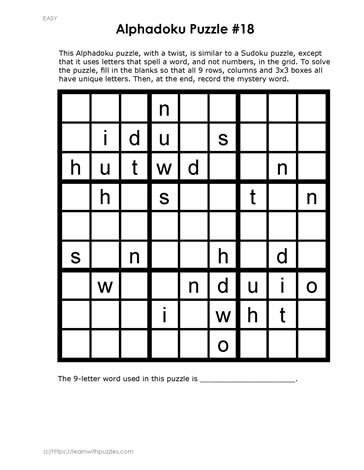 Discover a unique nine-letter word used to create this Alphadoku puzzle, similar to the Sudoku puzzle, by applying the simple basic Sudoku rules. Instead of using the digits 1 to 9 to solve the 9 by 9 grid, use the letters from the unique nine letter word. 1. Each letter can only appear once in each column. 2. Each letter can only appear once in each row. 3. Each letter can appear only once in each three-by-three grid. Once the puzzle has been solved record the nine letter word in the space below the puzzle.